Guest Post: Andy Mellen, Facing A Different Future? I can’t recall ever hosting a guest post before, but this approach seemed both worthwhile and important. 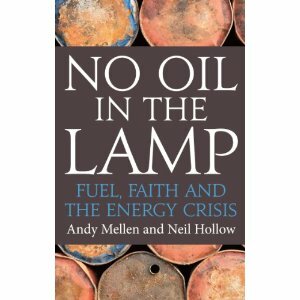 Andy Mellen is the co-author with Neil Hollow of ‘No Oil in the Lamp‘, a Christian response to the Peak Oil crisis. About three years ago, I heard Sam Norton give a theological lecture on Peak Oil in Chelmsford, and his blog Elizaphanian is a useful source of informed comment on the problem. Because I had had my eyes opened by that experience, and because I am not myself a scientific specialist in this area, I was only too willing to host a piece on this subject. Our ideas about the future tend to be conditioned by our experience of the past, so if you were born in a developed country sometime in the last sixty years, it’s likely that you have experienced a rising standard of living, with increasing comfort and convenience. Yet we only need to look back a few generations to see how much has changed, and how much we take for granted: We flick a switch, assuming that electricity will be there to light up the bulb. We expect to be able to travel long distances quickly, in comfort and at reasonable cost. We think nothing of sitting down to a meal whose ingredients have been transported across the globe to our table. These things and many more besides have become basic expectations – and as Christians living within a modern, developed country, we share them. Whilst we may bow our heads and give thanks for God’s provision at the start of a meal, in many other ways we take the conveniences of modern life for granted. We might expect the future to look something like a continuation of the past, but what if that isn’t possible? It takes an enormous amount of energy to make the modern world work. The average household is using more energy today than at any time in the past. Globally, use of oil, coal and gas has at least almost doubled since 1970. The unfortunate thing is, there aren’t unlimited amounts of these commodities to fuel our lifestyles way into the future. In fact the most critical energy source – oil, which provides 90% of all transport, is already beginning to decline. So what does this mean? Well, it’s complicated, but also surprisingly simple: The good news is that nobody is saying we are going to suddenly run out of oil. The bad news is that declining oil production will cause us a host of difficulties in the years ahead. Experts predict a two-stage process: firstly high energy prices (which we are already experiencing) and eventually actual physical shortages. High prices are already giving the global economy a headache, and straining the finances of households. Actual shortages would provide an enormous challenge for society, the economy, food supplies and much more. A smooth transition to green renewable energy is what some people are hoping for – others are looking to science for the answer – new forms of energy, maybe hydrogen? Unfortunately, no technology is in a position to do for us what oil does today. So what can we do? Is it a case of waiting for the Prime Minister, the UN, or someone else to take action? So far, despite credible voices speaking up, very little attention is being paid to this problem at Government level. However, at the grass-roots, in communities across the UK and increasingly across the world, something very interesting and exciting is happening. It is something called Transition. You may not have heard of it unless it is happening in your area, but the Transition movement is fast becoming the most positive response to the problems of resource constraints and climate change. Although it may sound a bit wacky and alternative, the heart of Transition is a very simple idea: we need to move away from oil dependence and instead build resilience into our households, communities and the local economy. Just how this plays out is different in every community, but the places which have embraced the concept are already starting to reap the benefits in terms of a more vibrant local economy, stronger community and reduced energy use. So far, I know that many Christians are individually involved in these initiatives, though I have not heard of any church becoming directly linked to Transition. Yet many of the qualities of the Transition movement overlap with what we might call “kingdom values” – concerns we see in the Bible. Three spring immediately to mind: Stewardship of the earth (humankind is given responsibility for the earth in Genesis 1), the principle of justice is seen throughout the Bible, (and particularly in the writings of the prophets, from Amos to Zechariah) and the principle of simplicity as espoused by Jesus, (most tellingly in Luke 17: “A man’s life does not consist in the abundance of his possessions.”). The church in the past has shied away from engagement with environmental issues for fear of contamination with “new age” philosophies. But it seems to me that the Transition movement offers an opportunity for Christians and the church to engage with something good, wholesome – and urgent. Posted on September 15, 2012, in Current Affairs, Religion, Science and tagged Andy Mellen, Neil Hollow, Peak oil, Sam Norton, Transition Towns. Bookmark the permalink. 6 Comments. A guest post – this is serious. I’ve just looked up my Environmental Dictionary. Sometimes environmentalists are asked to take on too much. It’s never a good idea to apply PRESSURE to finite natural resources. It’s a nice acronym but I must confess I’m not quite sure what point you are making? I hope my guest post wasn’t eerily simplistic – but hope it waqs perhaps enervating. Andy, I was making the point that pressure is eerily simplistic. And enervating means “exhausting”. Environmentalism is a passion – and a necessary one – passion should never be forced. I’m sure you’d agree. I confess I too don’t understand the point you are trying to make. I went to a talk at GB2012 given by Douglas Alexander. In the question time a woman tried to get across to him we will not be able to continue business as usual. He assumed it was a choice and refused to accept it. The time is coming when we won’t have a choice, we will have to change the way we live. That’s what we are trying to say. I am a Greens voter (and take some flak for it). I agree – we will have to change destructive behaviour towards the environment, no question about that. Thanks for your point of view,Neil.